The stunning Razer BlackWidow X Chroma ditches the plastic casing for a more confident look, but has little else to justify its price. Razer rarely takes the “less is more” ideal seriously. Most, if not all, of its products are heavily decorated with elaborate lighting and eccentric design. The Razer BlackWidow X on the other hand is one of few Razer products that strives for simplicity. The BlackWidow X Chroma puts its switches on full display by stripping away the plastic casing and exposing its thick metal backplate. This new design shifts the gaming-oriented aesthetic that’s signature to Razer’s BlackWidow keyboard to something more low-key and professional. The keycap font has been changed to a modest (and quite frankly more pleasant) typeface in accordance. Despite the more traditional look, the Razer BlackWidow X Chroma still targets the gaming crowd, which is why we’re scratching our heads as to why Razer took away the dedicated macro column. While it does feature full-board programmability, it’s nowhere near as convenient. At the cost of a slightly larger footprint, it would have added much more value to the product. The BlackWidow X Chroma is currently only being offered with Razer’s Orange or Green Switch, but Cherry MX variants are close in tow. 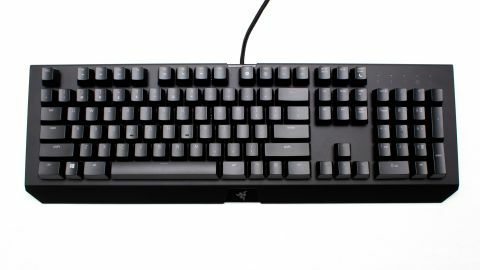 Our review sample carries the clicky Razer Greens, which mimics the Cherry MX Blue switch in both feel and sound. When pressed, the Razer Green produces a loud “click” when it travels beyond a tactile bump point. It’s also a fairly heavy switch, requiring 50g of force to actuate. Actuation point has been reduced to 1.9mm from the Cherry’s 2.2mm for a faster response time. Even by being long time users of Cherry MX switches, we had a hard time distinguishing between the Razer Greens and the Cherry MX Blues. Though if we really had to pick, we would still go with the Cherry MX Blues as the Razer Greens feel just a touch chalky at the tactile point. The reduced key travel didn’t feel too noticeable in use. While the tactile bump is great for typing, it may get in the way of gaming. Because the bump acts as an extra resistance point, it can cause the switch to rebound slower. This is especially problematic if you need to repeatedly press the same key. We’re glad to see Costar stabilizers installed under the larger keys. The particular sets of stabilizers on the BlackWidow X are well-greased and quick. They’re also noisy. The spacebar registered a whopping 85db on our sound meter at the source and 64db from 50cm away. Lest you want to face the wrath of sleepy roommates, make sure the room is clear before gaming. On the upside, Razer’s Green switches are tested to 80 million keystrokes. That’s more than the Cherry MX’s 50 million or the Logitech Romer-G’s 70 million. The 10-key rollover anti-ghosting matrix on the BlackWidow X Chroma can handle up to 15 simultaneous keypresses without a hitch. It’s quite NKRO, but it didn’t bother us in the least. Just like all the other keyboards in the BlackWidow line, the BlackWidow X Chroma still lacks some much-needed dedicated media controls and USB pass-throughs. Being one of Razer’s premium products, we wonder if these sacrifices are too much to bear. Razer pairs all of its peripherals with its Razer Synapse software. Up to 10 profiles of macros can be programmed with the macro editor and stored on the PC. For gamers looking to bring the keyboard to LAN tournaments, Synapse can create a custom install of the driver with all of the settings saved. A slew of lighting patterns is available as well. The brightness of the Chroma backlighting has been dialed back a notch so it no longer projects a rainbow on your ceiling. Other than that, it can still be configured to display a dazzling array of 16.8 million different colors. Because the top-mounted LEDs can only illuminate the top portion of the keycaps, Razer has made the bottom half of the keycaps opaque. Coming in at $160, the Razer BlackWidow X Chroma undercuts the flagship BlackWidow Chroma by just $10. It attempts to justify the lack of a dedicated macro column with its killer new design. While there’s no denying that the BlackWidow X Chroma is one of Razer’s most gorgeous products to date, its bland feature set brings little incentive for the buyer. Unless you are truly head over heels for the new design or really love Razer’s Green switches, you’re better off investing your money elsewhere.